I kind of disagree with your #7. You should use Times New Roman or Arial because they are generic but more importantly they are readable. Other types of fonts can come across as unprofessional and sometimes makes the readers life more difficult. Not saying you can’t use other fonts but if using other fonts then take care to make sure they are readable and not distracting. Times New Romans or Arial will still look very professional and everyone has access to it. Plus other other fonts might have no commercial use attached to them that the author might not know. Fair point! If I picked up a book written in Comic Sans, I would probably cry myself to sleep. That being said, there are tons of other great fonts out there — Cambria, Garamond, Helvetica, etc., which are excellent substitutes for the more common Times/Arial and still extremely readable. I think I shall put in an addendum to #7 specifying the importance of the font being readable. Thanks! 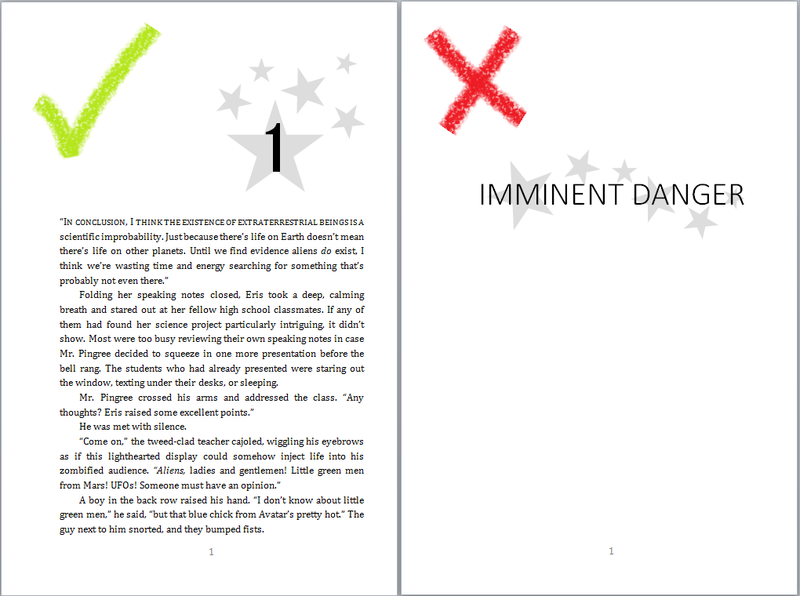 I almost want to write a book now in Comic Sans, just to see what people would do, lol. Oh, you’re making my heart hurt just thinking about an entire book in Comic Sans. Thanks very much 🙂 The pictures took forever, but I’m really happy with how they turned out. Plus it’s always fun to mess around in Paint, lol. Well said. I agree with everything except page number location. Before I published, I checked every paperback on my shelf and all fiction except three (and there were a lot of books) had page numbers in upper right corner. 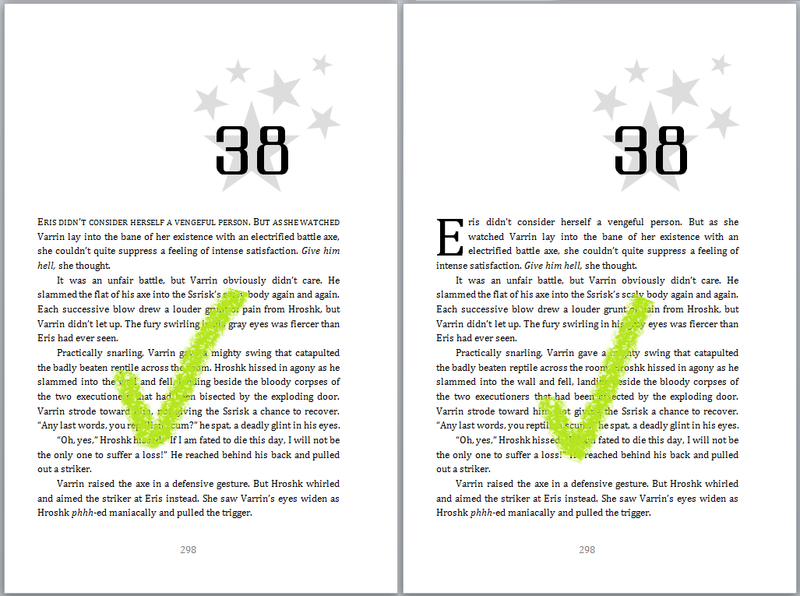 When I am trying to locate a page number, thumbing through the top right corner is much easier and quicker than trying to find it via the center at the bottom of a page. Just my opinion. Fantastic article. Do you mind if I share this on FB with my readers? Thanks 🙂 And please, by all means share! Very good information for those going the self-publishing route. I agree with #7 as far as Arial goes. My own preference for type is Times New Roman or Garamond. Most of the time, I choose Garamond. I’ve heard (and I don’t know if this is true) that books should use serif fonts (like Times, Garamond, etc. ), because serif fonts are easier to read for long periods of time than sans-serif. 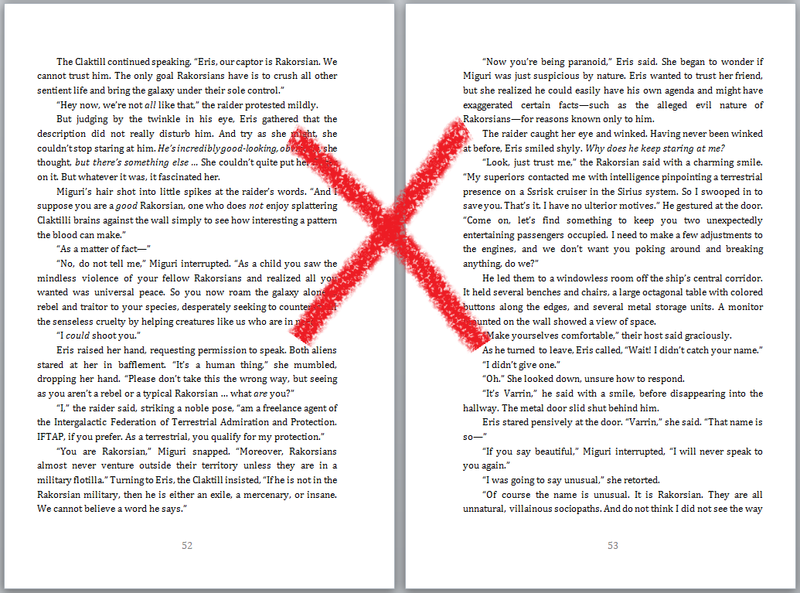 I’ve found a few teen dystopian novels written in sans-serif, and I did notice the reading felt a bit … stilted. It’s pretty much accepted in the world of printing that serif fonts are much more readable for print books. An important aspect to consider when choosing which serif font to go with is weight – how heavy it appears on the page – and the style. It’s amazing how they can affect the reading experience. I’d wouldn’t advise anyone to consider Ariel for print fiction – it could come off as unprofessional. 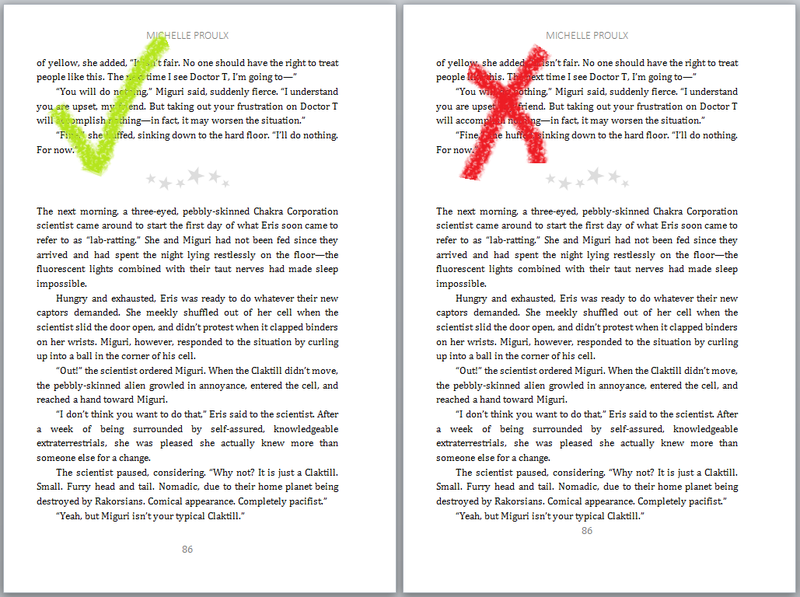 For ebooks Ariel is an option, though – the type works well on electronic pages. I do 1.5 spaces between paragraphs. good points . 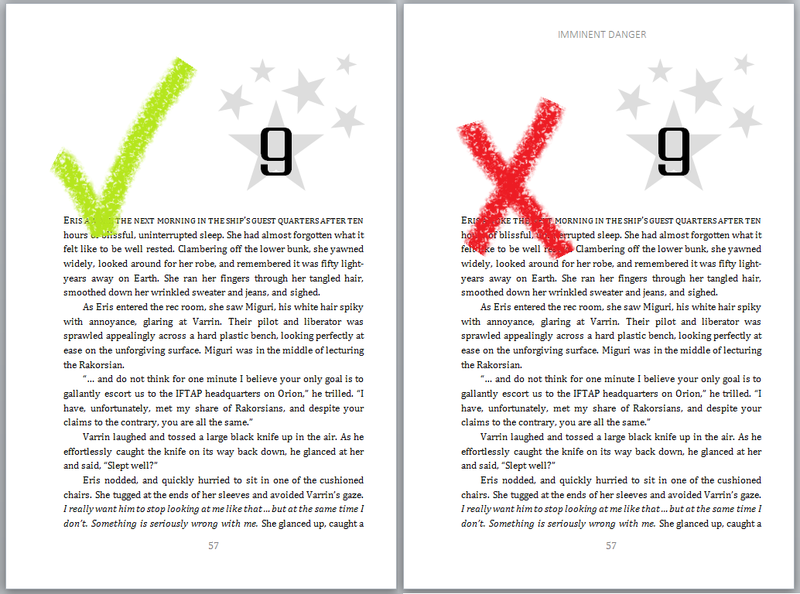 It is the fine tuning that makes a book look excellent! Some good advice on self-formatting. Except for the part about Times New Roman. Times New Roman is the Once And Future Typeface–when the stars are right the Legions of Times New Roman will rise from the vasty deeps to devour all other fonts. Hmmm. Standard font for novels is Garamond…and standard header is author’s name on the even pages, title on the odd. One thing you didn’t mention is justifying the right margin. As for italics – no, no, no. Not for emphasis. Your writing should convey emphasis, and you have to give your reader some leeway, not micromanage him. 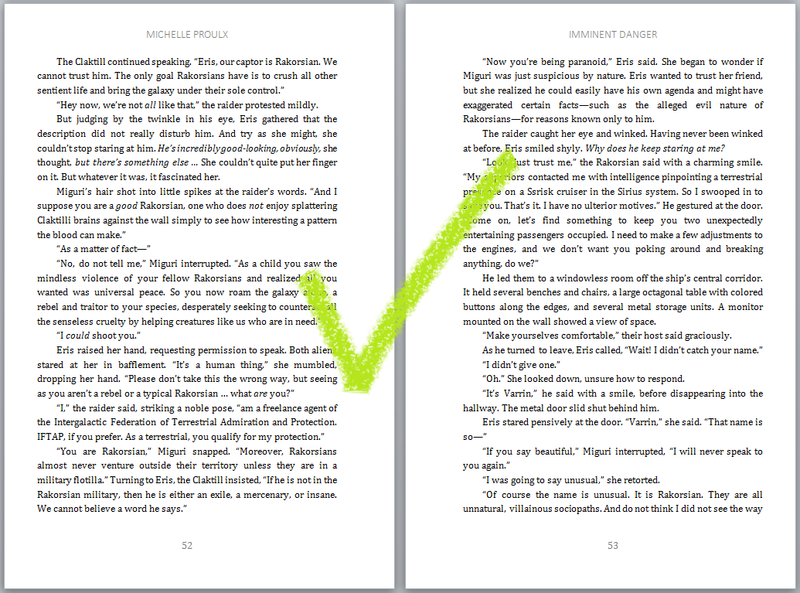 Also, paragraph indents should be about .25, not .5 – check some of those books from the Big Five. Excellent point on the right justification. I’ll add it in! I agree with Green Embers regarding the font. Times New Roman looks professional, but I like a lot of the points you made. Thanks for having an example of white vs cream. My sister could not find a book with white pages so we could compare. I never thought of it as being like a text book. Hey, fair enough 🙂 The awesome thing about fonts is there are so many of them, and for some reason people (including myself!) have very strong opinions of them, lol. I think I’ve just written so many essays in my life that Times New Roman has lost its charm for me. Glad to help with the white vs. cream! It was a very real problem that came up for me because I’d originally published my book with white pages, but when I got the proof copy I was like … something is off about this book. Then I got a copy in cream and all was revealed. I prefer outer-aligned running headers (if only for the echoes of Elder Gods in the name), rather than centred running headers. Or, if the page number is at the top of the page, the equally pleasingly named gutter running header. Hey, fair enough! These are, of course, just general tips. Not to mention center-formatting is the easiest thing to do, so that’s what I use, lol. Oooh. Disagree on the Times New Roman. You want it to be easy to read. And apparently serifs are good for the eye. Should go with a Serif font. 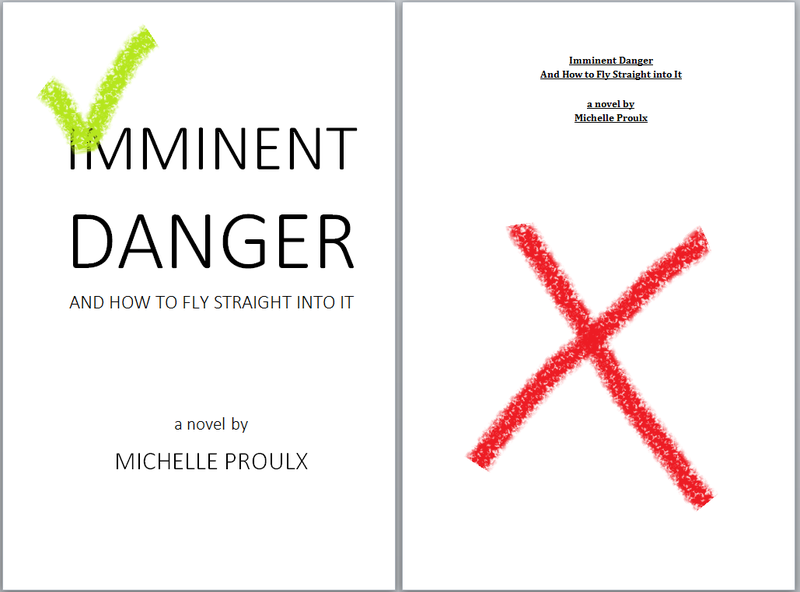 And I fully understand why people should go pro with cover design but I’m going DIY with mine. I’m a rebel with a plan! My main issue with Times New Roman is that I’ve written about a gajillion essays in Times New Roman, and I’m utterly sick to death of it as a result. So whenever I see Times, I think “essay hell”. Also, 100% agree on your serifs point. Sans-serif text in a book just feels weird to me. 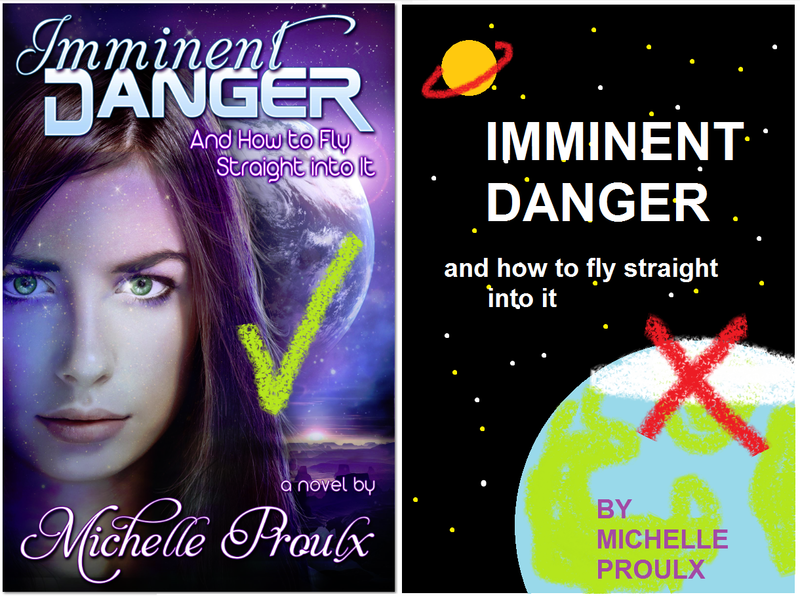 Michelle, in her infinite wisdom (seriously, she’s pretty guru-esque) and general concern for publishing matters, has compiled this nifty guide that all self-publishers, especially those in charge of all their own formatting decisions, should look at. Plus, you get to see some of her SWEET paint skills! Awesome practical tips on making your self-published work as polished as possible! 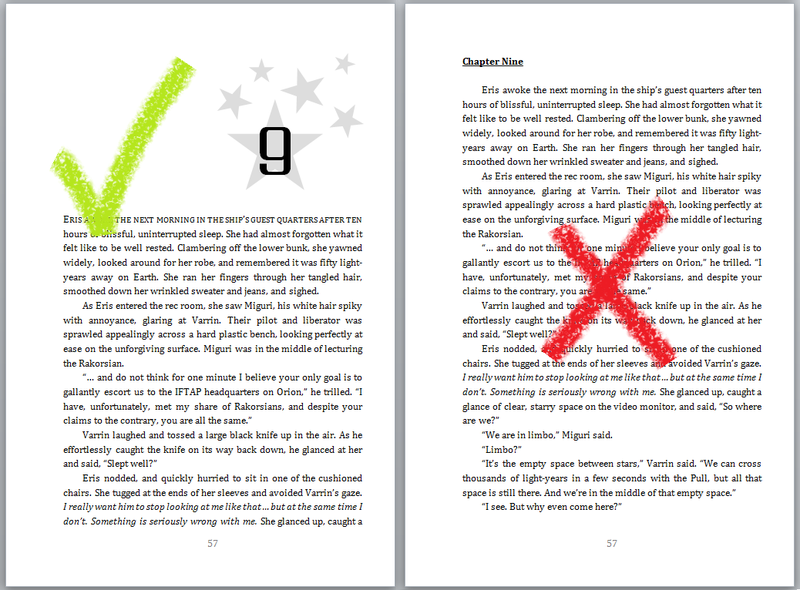 Turning your e-books into traditional paperback format can be a daunting process. Here are a few handy and helpful tips for folks who are planning to do it! Im happy to say my book meets all of your points! I saw a presentation recently that might explain why cream paper is so popular. It explained that while contrast is important for being able to see the letters, too much contrast (black text on pure white paper) can be a bit hard on the eyes. We might not notice it consciously, but after a while it can make us more likely to put the book down. Putting the text on an off-white page makes it easier to read. I’d never even thought about contrast being the reason I prefer cream to white — I’ve always just linked white paper in my mind with textbooks. But that does actually make a lot of sense. I do feel a bit calmer when I pick up a book with cream paper, lol. This is a great resource. The side by side comparisons are great! I think seeing it visually in this way really gets the point across. Thank you for this! A friend asked me to format his story for him and it’s my first attempt at such desktop publishing. These are exactly the easy, effective tips I needed to see. Is it ok to use italics for characters inner thoughts? I do, so I’d say yes!